A well looked after caravan will serve you for more than 10 years. Most caravans and motorhomes have a practical shelf life of about 15 years, and we’ve seen some that are even older than that. Things to look out for to keep your caravan on the road (and habitable) include rusting bodywork, failing electrical systems and water ingress. You should also check underneath the caravan for corrosion every few months. If your caravan is looking worse for wear, the good news is most bodywork issues on a caravan can be repaired. Damaged paintwork can be resprayed and holes in bodywork can be welded up. Even holes in fibreglass can be repaired. If you own a caravan or motorhome that’s in need of a body repair, we specialise in repairing them. We’ve been doing this for several years so know a thing or too about doing the job right. Below, we’ll go over some top tips for caravan body repair. These should help you understand your options better. Small dents in aluminium or steel can be ‘popped out’ using suction and special tools that manipulate metal safely. Small dents in fibreglass can be filled in with a resin and sanded to create a perfect surface. You would never know a dent existed. Large dents are a tougher problem to fix because of the larger surface area involved. Most large dents will need to be manipulated with a puller repair kit and ‘beaten’ back into shape. Light scratches on paintwork do not usually go through the clear coat. This means it may be possible to ‘polish’ them out using a machine polisher and multi-stage process. This involves using various pad sizes for sanding, polishing and buffing. Deeper paintwork scratches that go through the clear coat can be filled, sprayed and blended in with polishing. For scratches that go down to the metal, it’s likely the panel will need respraying. Bumper scuffs can often be repaired without the need for replacement, so long as the bumper isn’t cracked, split or bent out of shape. Deep scratches can be sanded and filled to an OEM standard. If we believe that the structural integrity of the bumper has been compromised, however, we would recommend a bumper replacement. You can source this from the OEM or online. A third-party part is also fine. Collision damage will go through your insurer, assuming of course you were covered by comprehensive insurance at the time of the accident. The good news is collision damage won’t necessarily write off the caravan. We’ve seen plenty of smashed up caravans that are deemed repairable by the insurer. Bumpers can be replaced, headlights can be replaced – everything can be replaced to bring a caravan back up to spec. 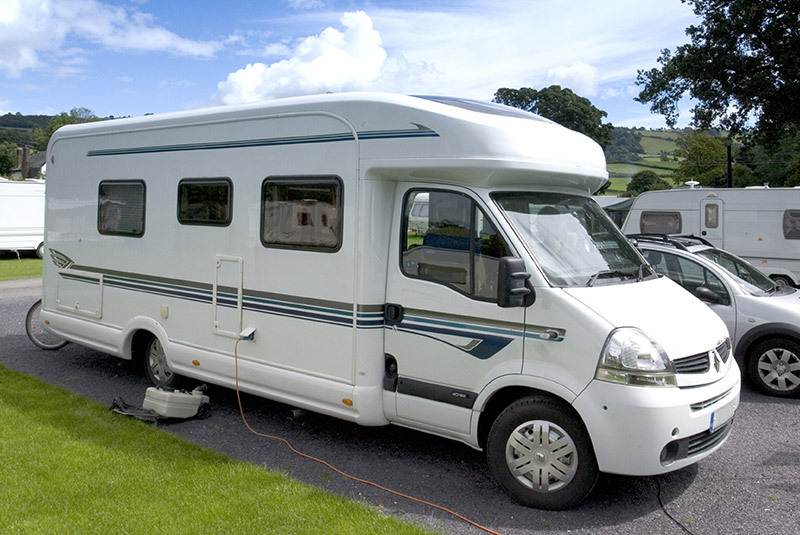 Many newer caravans have a fibreglass shell. Repairing fibreglass is a very different process to repairing aluminium. Small holes get repaired with resin, while larger holes can be patched up with engineered cloth and solidified with resin. Extremely large areas may need complete or partial panel replacement. The good news is repairing fibreglass is possible, and it’s also possible to salvage even the most badly damaged panels. Whether your caravan just looks old and tired or has a scratch that needs repairing, respraying is not something to skimp on. It takes time, patience and skill to paint a vehicle. Bad paintwork sticks out like a sore thumb. The Bodyshop you go to should source the correct paint code for your vehicle and replicate the original colour. Alternatively, you can opt for a colour change. Now’s a better time than any. A common problem with caravans and motorhomes is as they get older they suffer from water ingress. Damp is a tell-tale sign of this. It can be very expensive to put right, since it can cause irreparable damage to the interior. It’s therefore crucial that the source of the water ingress is identified and fixed. Any outside seals on a caravan are potential culprits, so check these first and repair them quickly if they are at fault. Looking for caravan body repair in Leeds? We make caravan body repairs easy. Pop down to see us at our workshop in Pudsey for a quote or call us on 0113 440 1327 to discuss repairs for your caravan. We’ll do our best to get your caravan back to its former glory.